SB 1847, DOC III 1 AU Histamenon Obv: +IhSXISREXREGNANTInM - Christ seated on throne facing, raising hand and holding Gospels. Rev: +KWNRACL'OР OVKAC - Constantine standing, holding labarum with pellet on shaft and globus cruciger. (Constantinople). $250 5/21/03. SB 1847v AU Histamenon Obv: +IhSXISREXREGNANTInM - Christ seated on throne facing, raising hand and holding Gospels. Rev: +KWNRACL'OР OVKAC - Constantine standing, holding labarum with X on shaft and globus cruciger. (Constantinople). SB 1848, DO 2 AU Histamenon Obv: +IhSXISREXREGNANTIUM - Christ seated on throne facing, raising hand and holding Gospels. Rev: +KWNRACО›'OР OVKAC - The Virgin Mary standing facing on right, crowning Constantine X to left, holding globe cruciger. 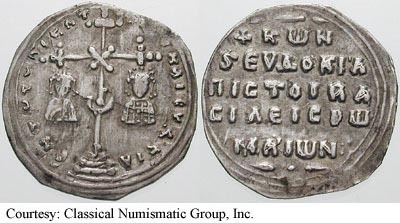 1059-1067 (Constantinople). SB 1849, DOC III 3 Tetarteron Obv: MHPО?U - Half length bust of the Virgin Mary, orans. 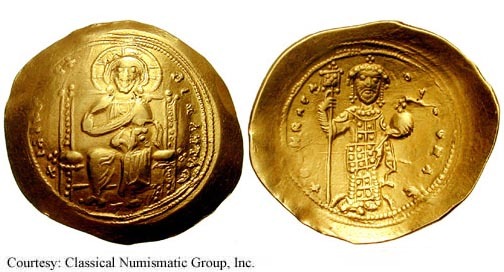 Rev: KWNRACIО›OО”WK - Crowned half-length bust of Constantine, holding globus cruciger. 1059-1067 (Constantinople). SB 1850, DOC III 4 AR Miliaresion Obv: Ornate cross on steps flanked by busts of Constantine and Eudocia. Rev: +KWN/SEVР OKI'A/О ICTOIRA/CIО›EICPW/MA'IWN: - Legend in five lines. 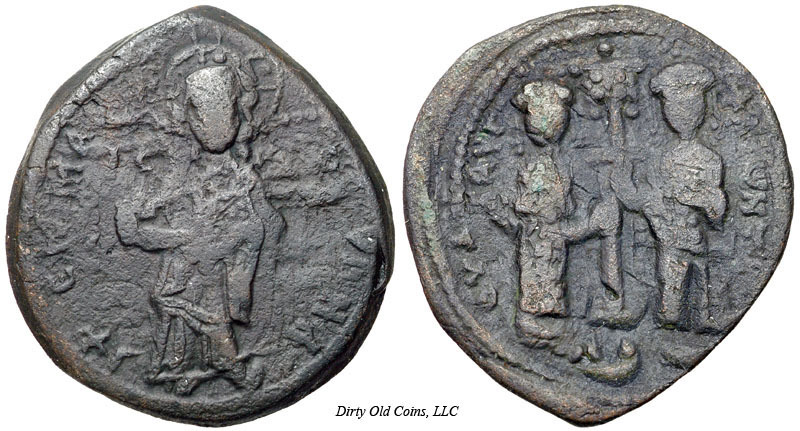 SB 1853, DOC III 8 Follis Obv: Christ standing facing, holding gospels. Rev: Eudocia and Constantine X standing, together holding labarum.